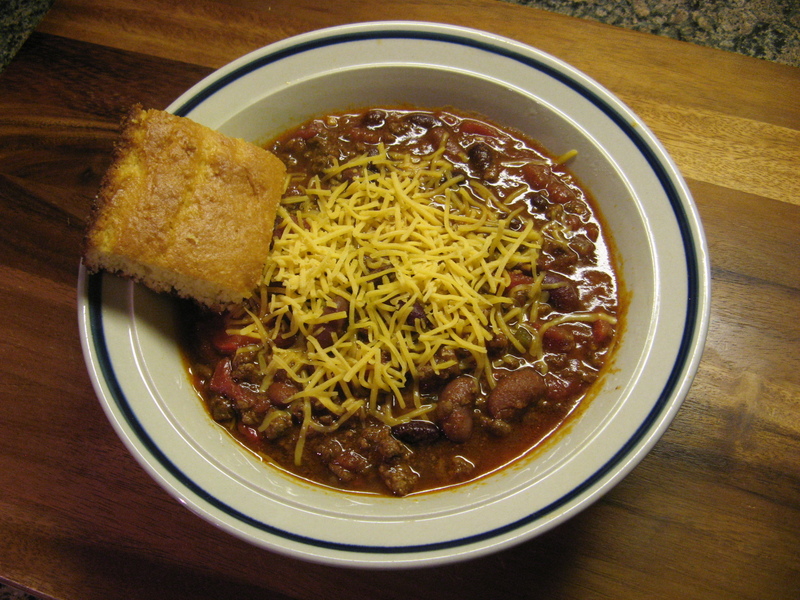 There are so many types of chili’s… Southwestern, White Bean, Three Bean, Vegetarian, Turkey, Chicken…. etc, etc, etc. Either way you make it the end result is pretty much the same… It’s delicious! 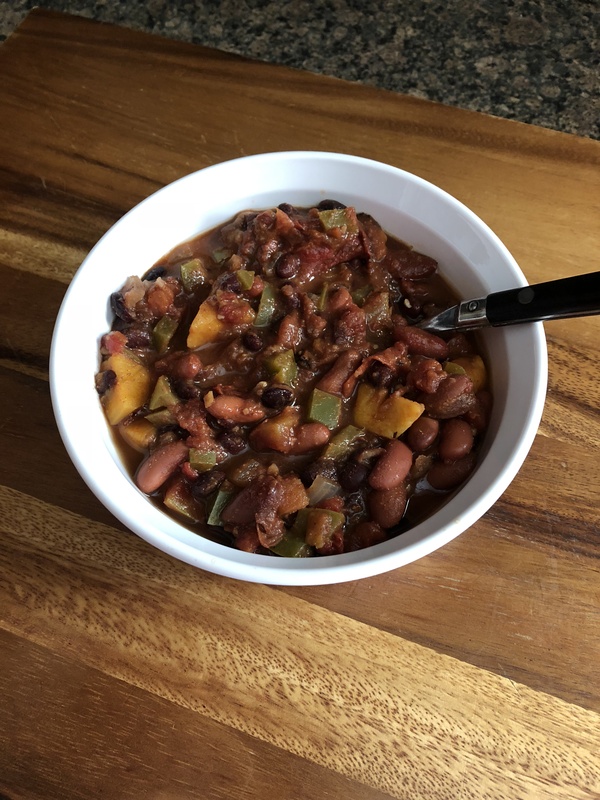 For today’s Slow Cooker Sunday series I’m bringing you a classic chili, well, classic in my book. 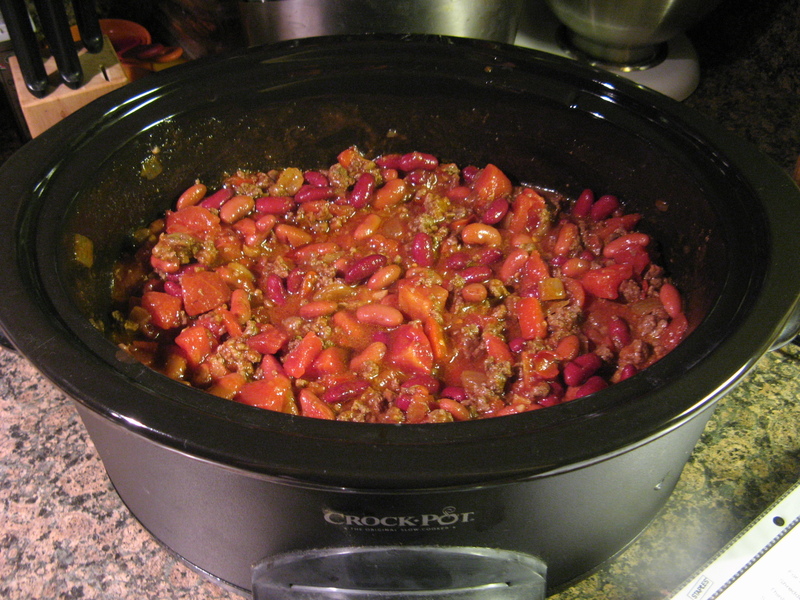 You know, ground beef, red kidney beans, some onions, cumin, garlic and so forth. 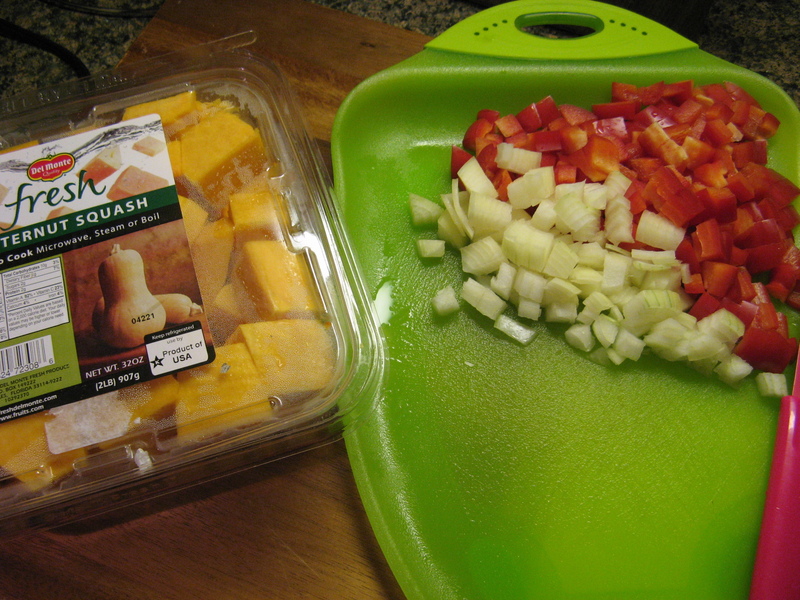 To begin, I sautéed 2 chopped onions and 1 chopped pepper in oil until they were softened. 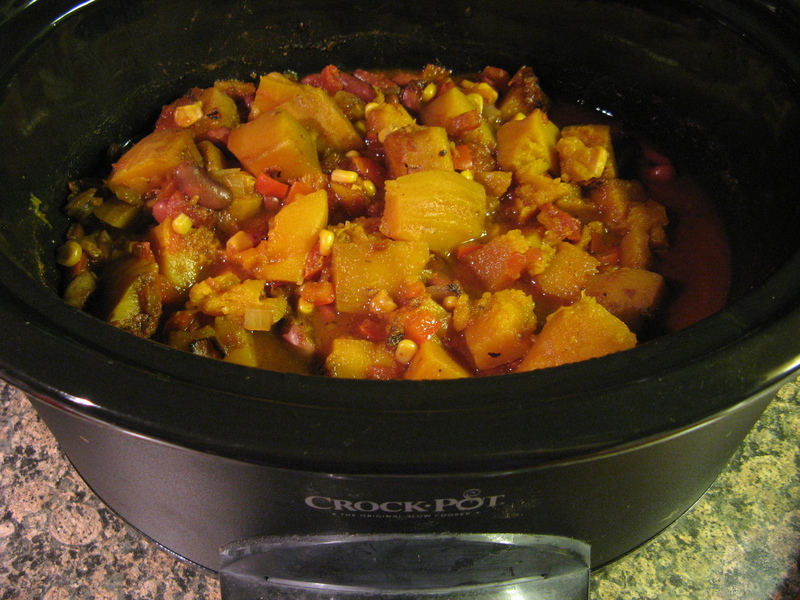 Once they were softened I added in chopped garlic, chili powder and cumin. And finally I added in ground beef along with salt. I broke the meat up with a wooden spoon and cooked it until it was no longer pink. 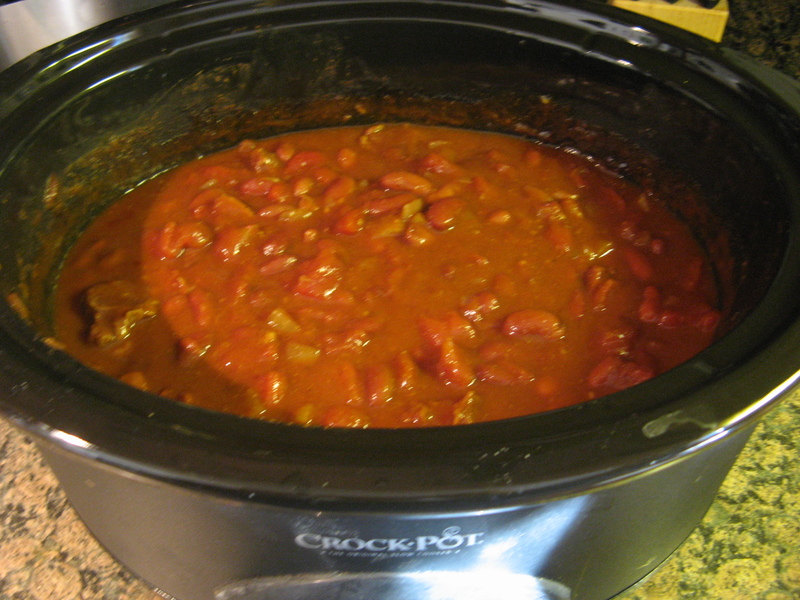 Next, I added the meat into the slow cooker along with diced tomatoes, tomato sauce and kidney beans. After stirring everything to combine it I covered it and cooked it on low for 8 hours. And after those 8 hours once the chili thickened and all the flavors blended together I stirred in some chopped green chilies. 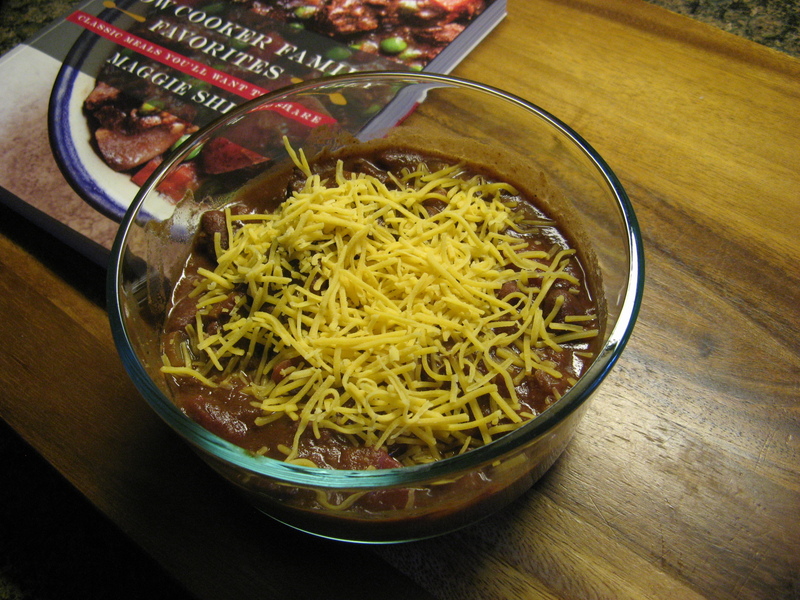 To serve it, I topped it with shredded cheddar cheese and a piece of cornbread that I made with a quick and easy mix from Jiffy. 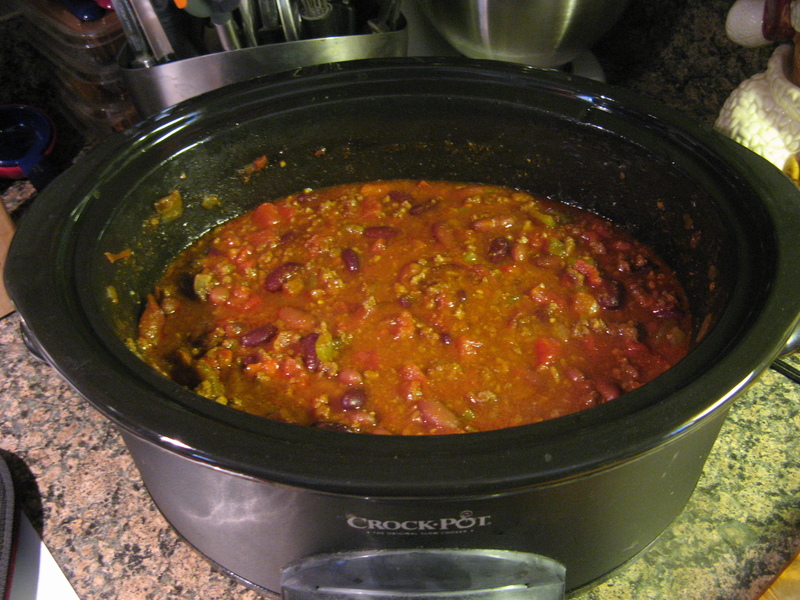 What’s best about this chili is the leftovers… It tasted even better the following day! 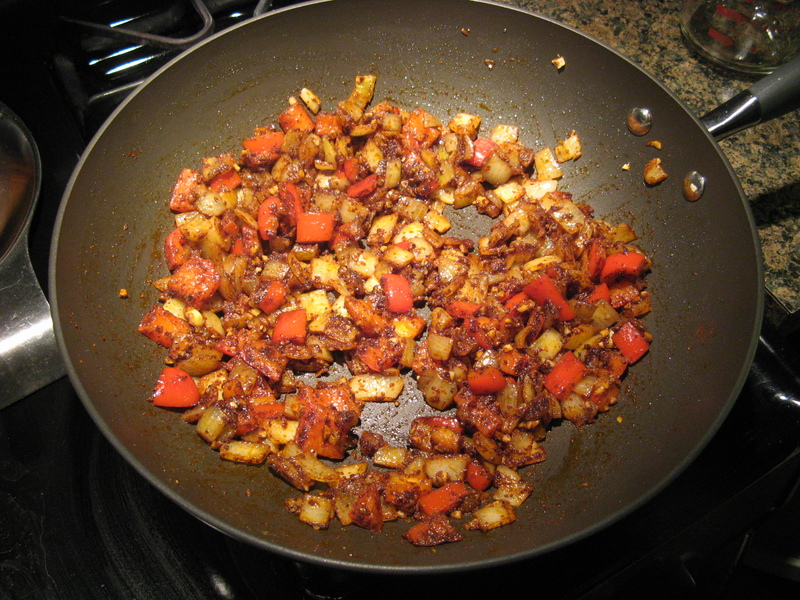 Heat the oil in a large sauté pan over medium heat until shimmering. 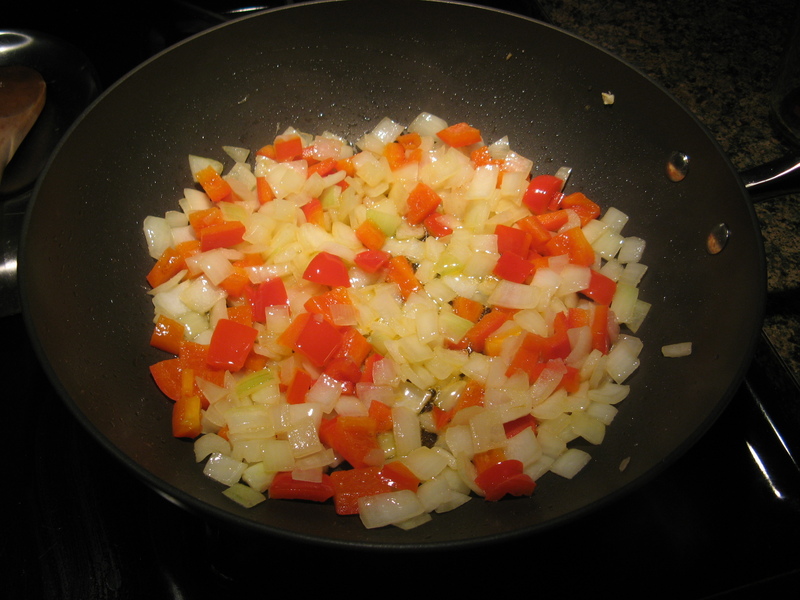 Add the onions and bell pepper, season with salt and cook until the vegetables are tender, stirring occasionally, about 8 minutes. Add the garlic, chili powder, and cumin. Stirring to coat the vegetables and cook until fragrant, about 1 minute. 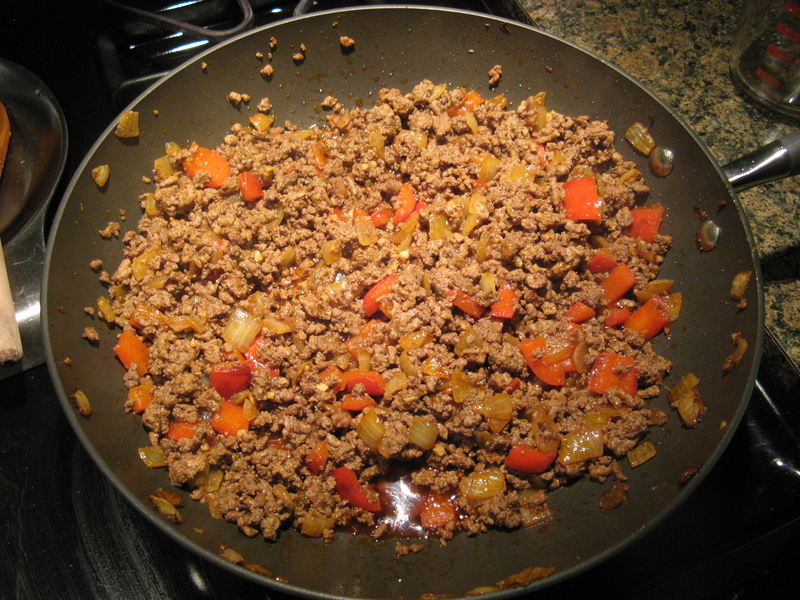 Add the ground beef and the measured salt, breaking the meat into small pieces with a wooden spoon. Cook until the meat is no longer pink. 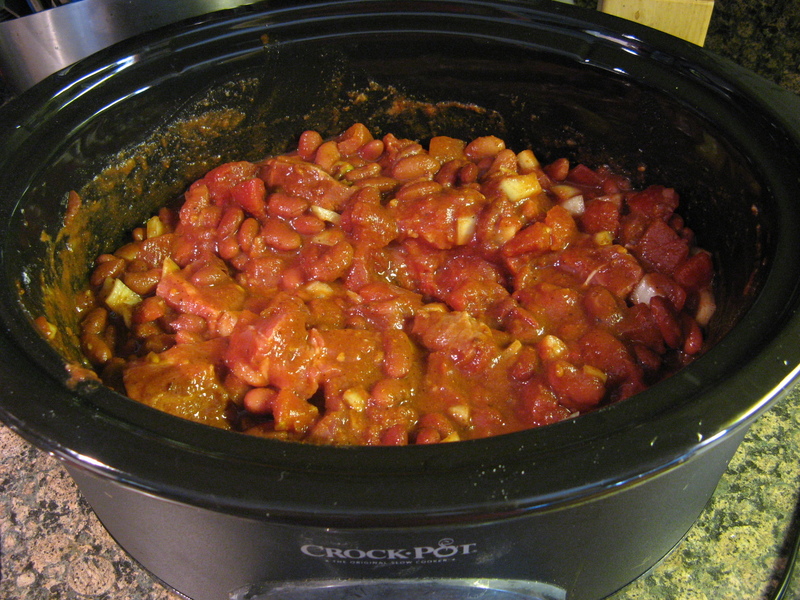 Transfer the mixture to the slow cooker, add the diced tomatoes and their juices, tomato sauce and beans, stir well to combine. Cover and cook about 8 hours on low or 6 hours on high. Stir in the chopped green chilies. Season with addition salt if needed and serve with your favorite toppings. *** For the diced tomatoes I used two 14.5-ounce cans of diced tomatoes and for the tomato sauce I used two 8-ounce cans of no-salt added tomato sauce. 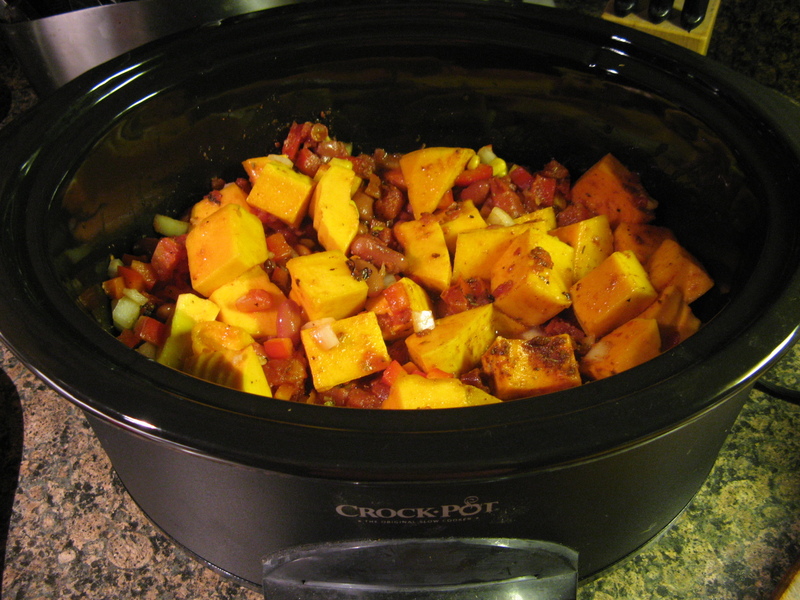 ****Please note I use a 5 1/2 quart slow-cooker.